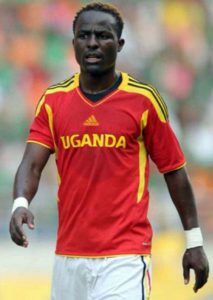 Tony Mawejje will feature in the Cranes team as Uganda takes on Ghana. Photo by Shaban Lubega. FOOTBALL–Interim coach Moses Basena has named a squad of 33 players to start preparations for the Uganda Cranes Regional tour of Northern Uganda and the 2018 FUFA World Cup Qualifier against Ghana. Murushid Jjuuko and Khalid Aucho donot appear on the squad due to suspension after accumulating two yellow cards each. The most notable name to appear on the list is FK Tirana’s Tony Mawejja who has been away from the national team since the AFCON tournament in Gabon. With the suspension of holding midfielder Khalid Aucho, it comes as no suprise that Mawejje has joined the fold that he has always featured in since 2007. The Cranes will play in Lira, Northern Uganda on September 30 and October 7 against Ghana at Mandela National stadium, Namboole. ‘The training starts on Wednesday September 27, 2017 at 4pm at Namboole stadium under the guidance of Basena and his technical team. The coach will reduce his squad based on the arrival of foreign based players in camp,” FUFA communication manager Ahmed Hussein said. ‘The players named will also get involved in the Uganda Cranes regional tour of Northern Uganda which will be the final tour of the year,” Hussein added. Denis Iguma, Nicholas Wadada, Godfrey Walusimbi, Isaac Muleme, Isaac Isinde, Muwanga Bernard, Hassan Wasswa, Timothy Awany, Adriko John. Tony Mawejje, Geoffrey Kizito, Mutyaba Muzamiru, Masiko Tom, Ivan Ntege, Ochaya Joseph, Miya Farooq,Kagimu Shafiq, Paul Mucureezi, Gadaffi Gardinho,Okot Fred, Ibrahim Kayiwa, Tadeo Lwanga. Luwagga Kizito, Karisa Milton, okwi Emmanuel,Idrisa Lubega, Derick Nsibambi, Nelson Senkatuka, Geoffrey Sserunkuma.